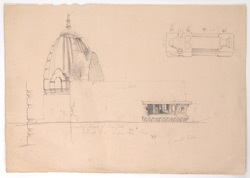 Pencil drawing by Frederick Charles Maisey of details of the old Jain temple at Sonawal near Datia, dated 1845 - 1852. Sonagiri, situated 60 kilometres southeast of Gwalior, is a site sacred to Digambara Jains. Around eigthy four white shrines with tall spires are dotted on top of a solitary hillock to mark the spot where the legendary King Nanganang Kumar and many Jain ascetic achieved liberation from the cycle of rebirth. The temple were built around 1300. In the 'Descriptive list of drawings of Captain Maisey', the artist wrote, "Sonawal is a place of Jaina worship 5 or 6 miles north of Datya. It is a striking and conspicuous place, there being no more than 57 temples, clustered together on and along a low rocky ridge, the ascent of which is by steps and ramps of masonery…All but one or two [temples] are quite modern…The exceptions are two small temples on the extreme left...: one has an inscription dated Sambat 1760 (AD. 1703): the other, which resembles it in style, but is evidently older, I made a sketch, plan, and section of, which render any verbal description needless..." This drawing depicts the spire and the pillared portico of the temple.